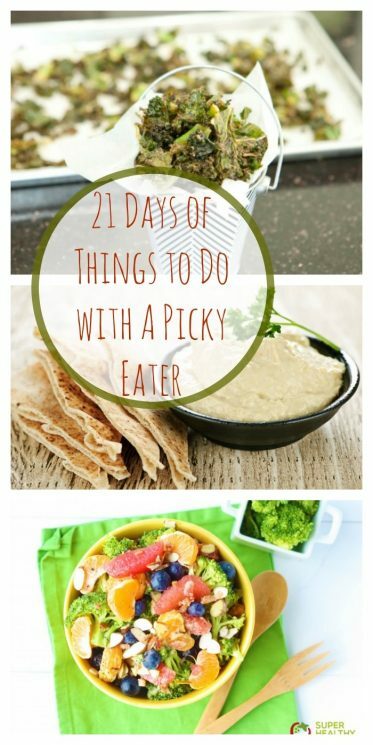 What to do with a picky eater in 21 days! 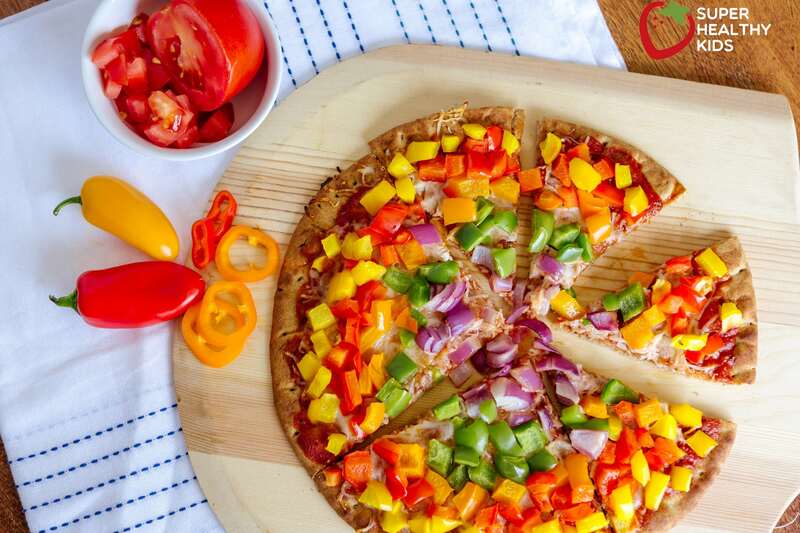 We know you want your kids to eat the healthy food you provide them. We also know it’s frustrating when you embark on a new healthy eating goal, only to find your kids are not on board with change! When kids are picky eaters, it’s difficult to stick with your resolve to improve things. It’s maddenig when you spend good money on healthy food and it gets wasted! It’s unfair when you see your friends kids eat well, yet your child won’t deviate from noodles and cheese! We want you to be confident that what you are doing is right, and we want your kids to be willing participants along the way. So, we’ve developed the slow, easy going, non-complaining, baby step approach to healthier eating for you and even the pickiest of your kids! We’ve selected 21 days of activities and a variety of experiences to help train your child’s palate, help them to become connected with the source of their food, and help them to make decisions on their own. One overlooked concept for parents is that there are so many ways to offer fruits and veggies. Frozen, blended, dried, canned, juiced, smoothies, raw, roasted, steamed, etc! So many kids have texture issues! My daughter won’t eat applesauce, but loves apples . But the trick is to offer fruits and veggies in their various forms because it might not be that they don’t like broccoli- maybe they just don’t like it steamed. With my kids being older now (they are 14, 12, and 10), I can honestly say, it just takes time! In fact, for some foods, it took A LOT of time! My oldest son has had vegetables on his plate almost every night for the better part of his life. He didn’t start asking for salad until the last few years. He complained about it from the time he could talk, till he was about 9 years old. Did I ever give in and tell him he never had to eat vegetables again because he complained? Of course not! I left them on his plate every single night and never gave up. The key to our success is that over time, your kids will understand that healthy eating is a part of life. It is said that by the time they are 10 years old, they will likely have the dietary habits that will carry them into their adult life. So, don’t give up! It’s worth it to stick with the goal of them enjoying healthy food! Take your kids on a food field trip to the grocery store, or Farmer’s Market. As a parent, I know getting your groceries alone is much easier. 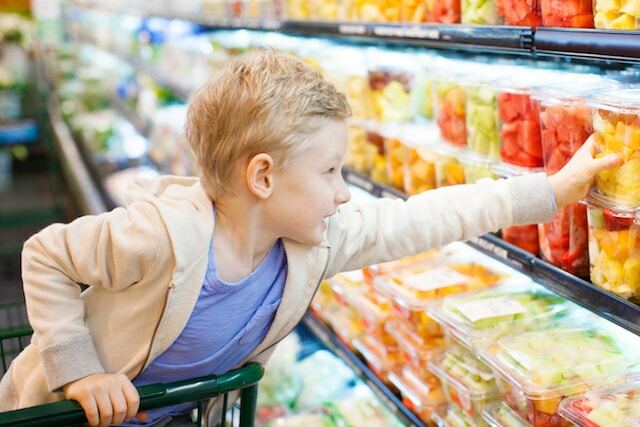 However, plan special trips to the grocery store just for your kids to browse the produce section of your store. While there, talk about the different fruits and vegetables they can identify. Ask them which fruits and veggies they’ve tried before, which ones are their favorites, and which new ones seem intriguing enough to test out. Let each child choose 1 fruit & 1 veggie that is their favorite, and one that they want to taste that is brand new. Take them home and taste them all. Artificial dyes such as Blue, Yellow, or Red. Smoothies and are a great way to ensure your kids are getting the recommended amount of fruits and vegetables in a day. The American Academy of Pediatrics recommends for children ages 2-8 of 1 1/2 cups of fruit per day and 1 1/2-2 cups of vegetables per day. 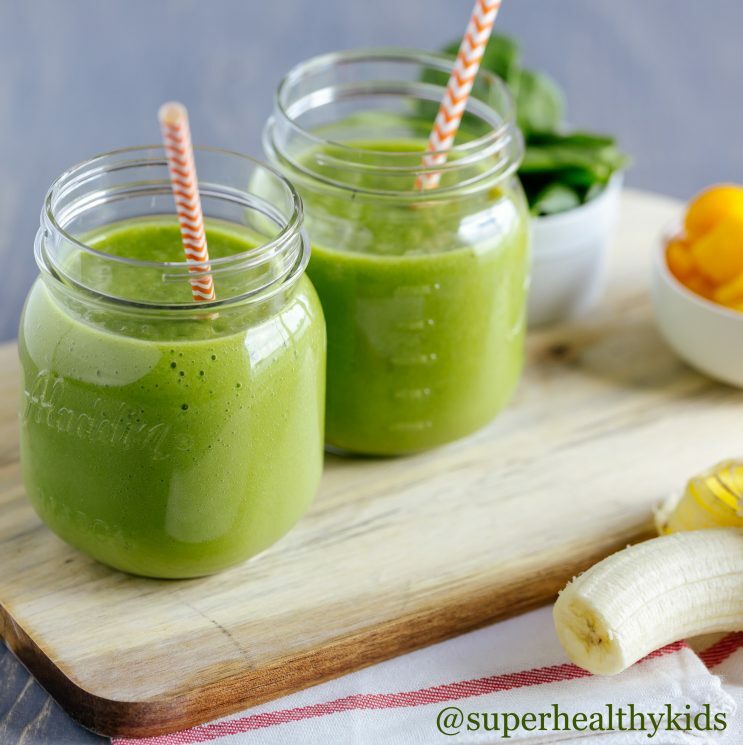 Starting your kids with a green smoothie each morning helps them get right on their way! Picky eater tip- We sometimes freeze our green smoothies into a popsicle mold. I did anything to make sure they at least got 1 cup of greens every day, and popsicles are an easy way to make this happen. 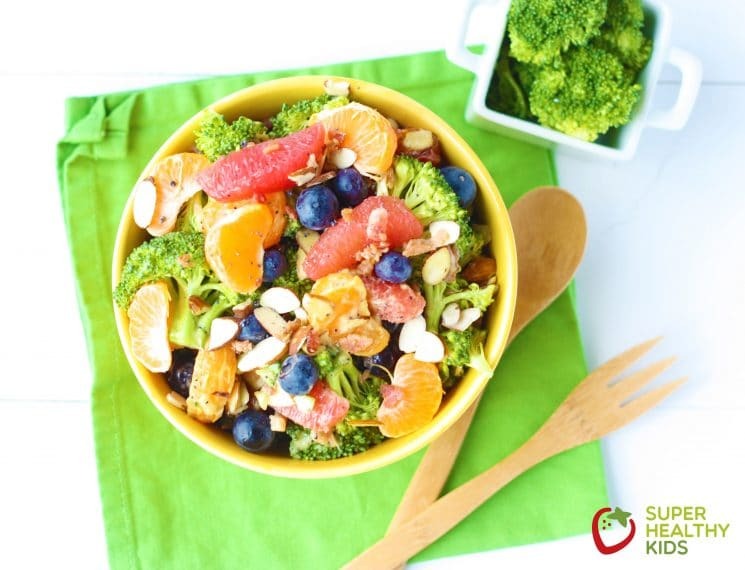 You can start with less greens if it’s new for your kids, and slowly add more greens each time you make it! Blend until smooth! 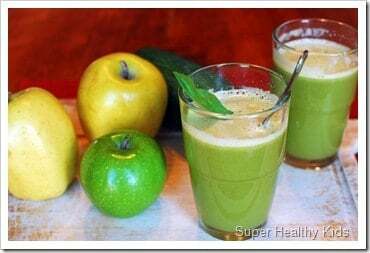 Each time you make this add a few extra leaves of spinach, until you are up to 1 cup per person. For more Smoothie options, check out our template here. The challenge today is to eat 4 servings of vegetables! This can be ANY 4 vegetables! The first time I issued this challenge to my kids, they ate 4 baby carrots. And that is OK! It’s like exercising a muscle, except this muscle is their taste buds. Eating four vegetables today (and more days if you choose), will start training those “muscles”. Washing and cutting the vegetables for your kids, so they are available and ready to eat, is paramount in getting kids to eat their vegetables. Arrange carrots, celery, broccoli, and peppers onto a platter, and leave out on the counter or table for snacking throughout the day. When your kids come to you “hungry”, direct them to the veggie tray. Using a paper plate and markers, let your kids divide their plate into four equal sections. Fruits, Vegetables, Grains, and Proteins. Have them draw pictures right on the plate identifying the food group. Talk about why it’s important to eat foods from each food group each day! Protein helps us build muscles. Vegetables gives us minerals that make the systems in our body work the best. and Fruits give us vitamins that keep us from getting sick. For a blank MyPlate coloring page, download it here. 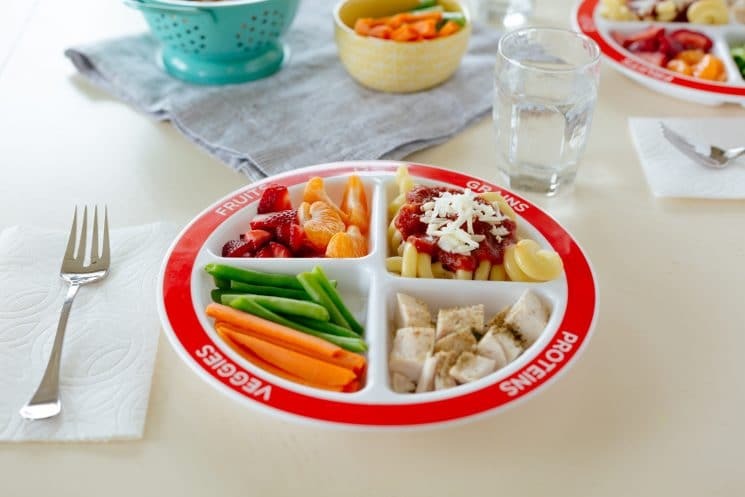 Also, check out our Kids Plates that reinforce the balanced meal approach. The first time I offered a salad bar for dinner, my pickiest eater said she would not participate. Upon demanding that she sit with us through dinner, she changed her tune! She said to me after seeing the spread: You mean we get to CHOOSE what we put on our salads? Then she had several helpings without complaint! Emphasize WATER. The 2010 Dietary Guidelines emphasize that we drink more water instead of sugary drinks. The best way to make this happen is not to have the sugary drinks available to your children. People I interview that exhibit extraordinary healthy lifestyles have mentioned there were no soft drinks or sugar drinks in their home growing up. 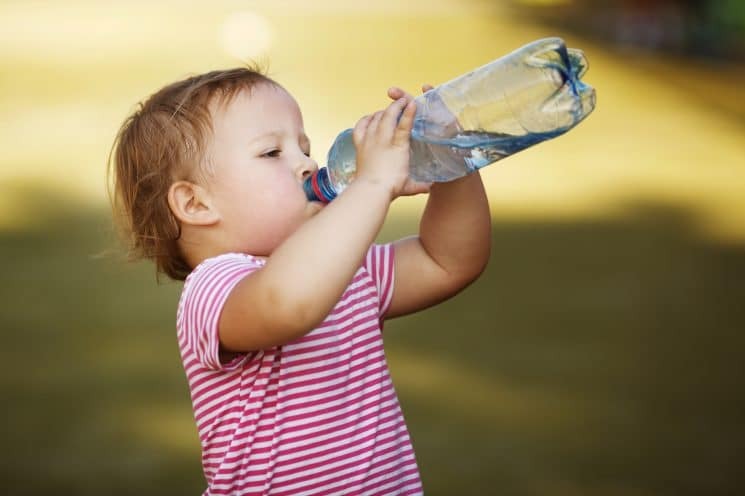 Talk to your kids about the importance of water as part of their diet, and do not accepting inferior beverages as a substitute. Give them access. Do your kids have their own water bottles? Their own cups? Do they know how to get a drink by themselves? This can be taught at a very young age. Most toddlers that visit my home LOVE to drink water because we have the little dispenser on the front of the fridge. They love to do this themselves. Explain the pee test to your kids. I had been misled to believe my children would simply drink when they were thirsty. The newest recommendations for the amount of water we drink, is to check the color of your pee. Dark.. drink more. Light…good to go! Flavor it up. Lots of people, including adults, prefer flavored water. There is nothing wrong with this. Add a squeeze of lemon, a drop of mint, or a handful of frozen cherries to their water. Delicious! We call this our science experiment! We just use fruits and vegetables of all different colors, and the kids make their own concoctions by combining them in any way they please. They love to do mix and match and they really love challenging their siblings to try their “New and amazing drink”. 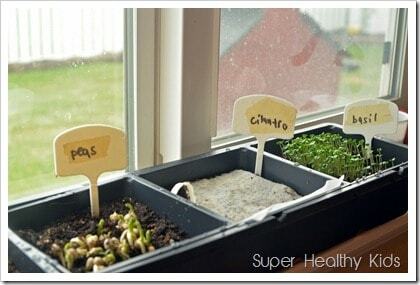 Sprouting is our mini version of gardening. Kids get the harvest in just a few days, and they can appreciate the fact that they grew it themselves. Alfalfa seeds are the perfect seed for first time sprouters. Rinse seeds in water and soak overnight. Drain water and let sit on the counter covered with a towel. 2-3 times a day let the kids come by and rinse the seeds. Once the seeds sprout, remove towel and put jar in the light to develop the chlorophyll. 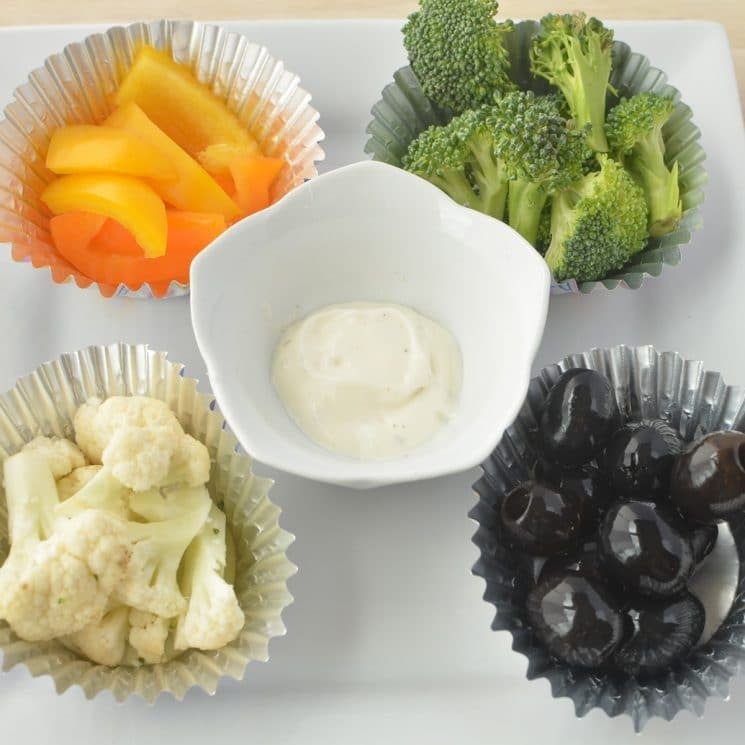 So, in order to introduce a new taste or texture (and not to mention the perfect texture for new eaters and toddlers, is steamed veggies. One popular steamed vegetable is green beans! 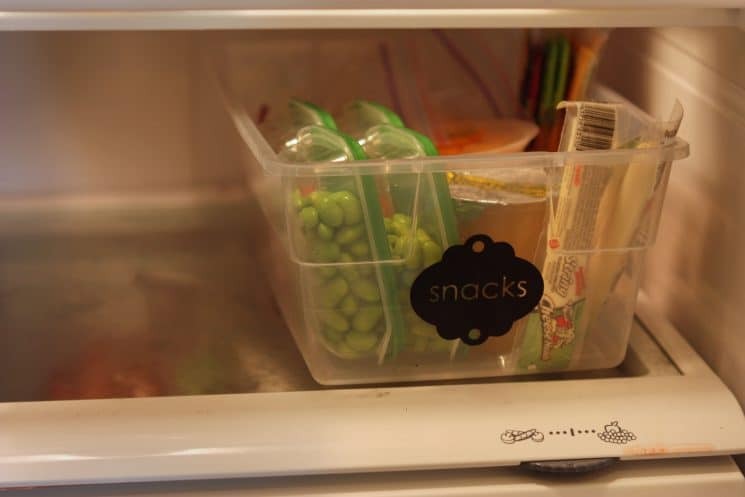 To steam without a vegetable steamer, simply add 1-2 cups of green beans to a microwave safe dish with a lid. Add 1-3 tablespoons of water to the dish. Put the lid on and microwave on high for 5 minutes. Optional: You can always rinse with cold water to stop the veggies from cooking and keep them slightly crisp at the end. A major contributing factor to kids refusing to eat their vegetables is their familiarity with highly sweetened foods. When you cut refined sugar out of your diet, suddenly fresh vegetables actually taste better! While we always recommend moderation, sometimes a reset is in order! Just for one day, challenge your family to not eat added sugar. Not in cereal, yogurt, granola bars, or even condiments. Just for one day! Real food always tastes better after a day of abstaining. 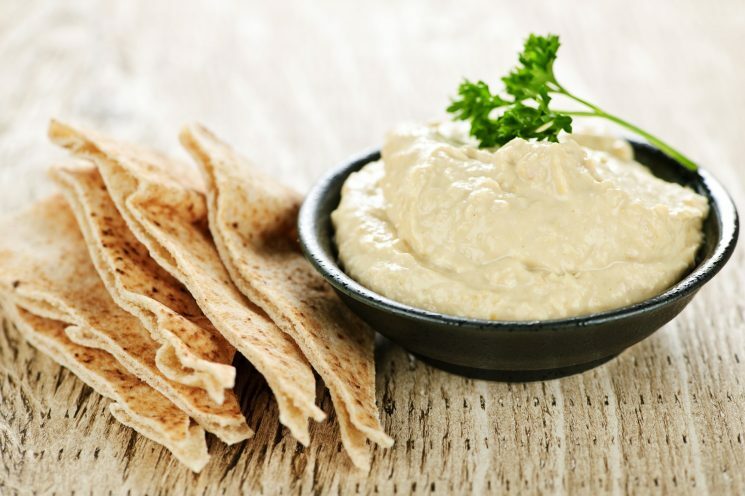 We have a great list of no- or low sugar snacks here! One way to instill and solidify a new behavior is to share it with others! Sit down with your kids to plan your Sunday meal and double to take to a neighbor, or to invite friends over for your meal! We have found our favorite meals to share is soups, packed with vegetables. Let your kids help plan, make, and deliver the meal. Mix noodle ingredients together until blended. The dough should be fairly stiff, but soft enough to knead. Flour your surface and roll out dough as thin as you can. Take a pizza cutter and cut out noodles into desired sizes. Let dry on the counter for 2 hours. Flip noodles after 1 hour. For soup: Pour water, chicken broth and onions into a stock pot and heat until boiling. Remove chicken and cut unto bite size pieces. Add noodles, chicken and veggies to broth. Boil 15-20 mins, until noodles and vegetables are tender. If you’ve been taking care of your sprouts, they should be ready to enjoy today! Add them to a sandwich at lunch, or top a salad with the sprouts. Choose what herbs you want to try to grow in a pot next. It’s picnic day! Sometimes, food is just more fun to eat on a blanket! If it’s too cold outside, plan an indoor picnic, but don’t forget the blanket, and you must sit on the floor! A rabbit picnic involves any stuffed animals your kids own, and a bowl full of carrots and lettuce. Wash, pat dry, and tear your lettuce leaves into bite sized pieces. Chop carrots into sticks or circles. Mix together in one big bowl that everyone shares. 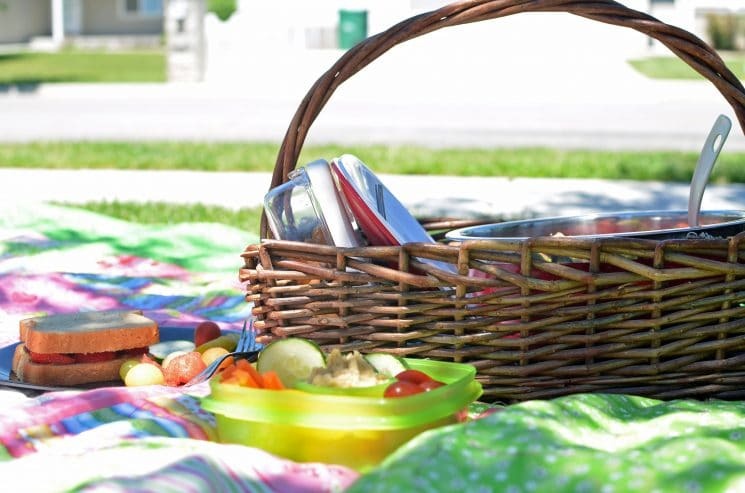 Bring the stuffed animals on your picnic, as they will enjoy the rabbit treats as well. As we mentioned on steamed veggie day, serving your vegetables in a variety of forms including raw, cooked, steamed, pureed, juiced etc. is how our kids develop their palates for a variety of foods. 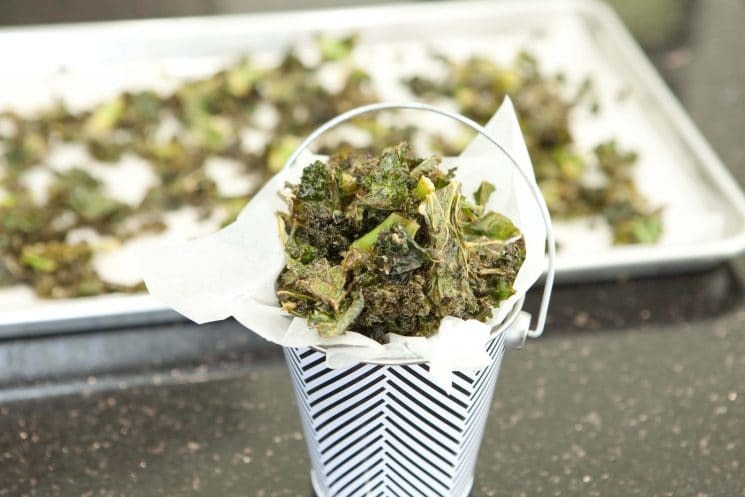 So, today, we want them to try Kale Chips! Preheat oven to 350 degrees. Chop kale into 1/2 inch pieces. Place all ingredients in a large bowl and massage the oil, lemon juice, and sea salt into the kale using your hands. Place on parchment lined baking sheets for 12 minutes. Wearing blindfolds, let the kids taste different foods that they may or may not be familiar with. After each food, they can write down (or tell an adult) what they think they tried. We did this at a recent birthday party, and all the kids tried everything I offered. I had a paper bag for each food item. The kids had blindfolds on. They tasted something from bag #1 first, until they tried foods from each bag. We had carrots, dried apricots, pomegranate seeds, slice of cheese, and a chunk from a pear. Some of those kids would have never tried these foods if it wasn’t part of a game! They all had a blast. The hungrier a person is, the more likely they will eat (and enjoy) whatever is offered. If you can imagine how you would enjoy a crisp juicy apple after you’ve just finished a Thanksgiving meal? Not much! In fact, it wouldn’t even taste good. But if you just ran race and haven’t eaten all day, that apple would probably be the best tasting thing to ever pass your lips! The same is true for kids. Many kids graze all day on food, and never truly get hungry. So, when dinner rolls around, it’s easy for them to refuse a healthy meal. However, if they stop eating a few hours before dinner, and better yet- PLAY outside, burning off energy from food earlier in the day, they will be more than ready to eat, and more likely to eat what you offer. So, today, on your last day of the challenge, close the kitchen at least 2 hours before dinner, and send the kids out to play and be active. See how things change for you and them at dinnertime! YOU DID IT! THE 21 DAYS IS OVER. 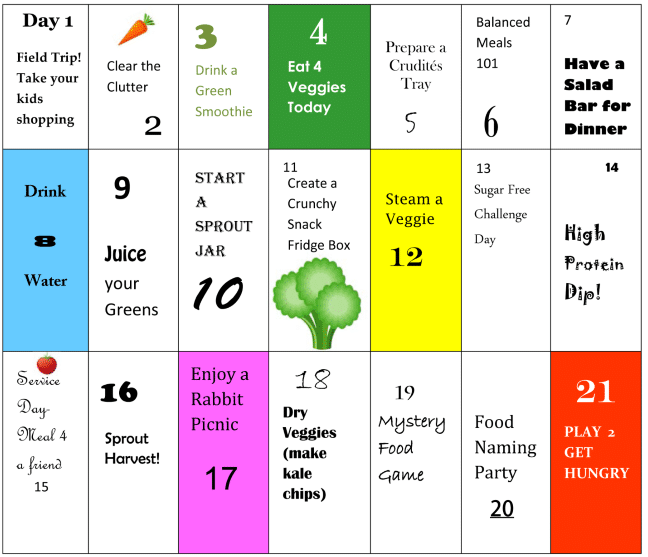 Look over the calendar and choose some of your favorite activities to continue with your family. NEED MORE IDEAS FOR HEALTHY MEALS? 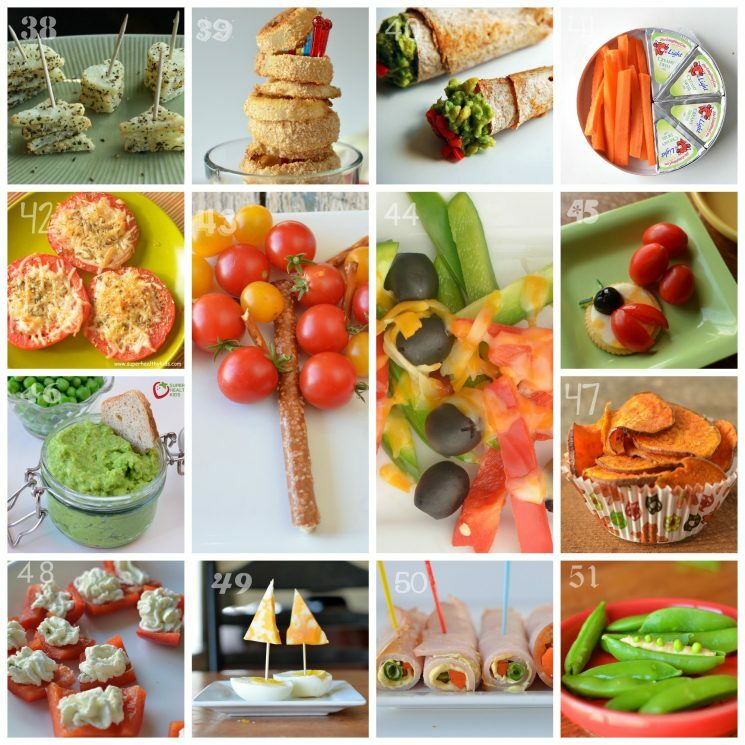 Our healthy meal plans are written to incorporate these ideas! Keep the momentum going by signing up today!